There are many different ways to enhance your sleeping experience. Mattress toppers, mattress protectors, wool comforters, wool pillows and organic cotton sheet sets are just a few of the natural bedding solutions we sell aimed at helping you sleep your natural best. Whether you want to upgrade the comfort and support of your new wool mattress, or put a layer of organic protection between you and your conventional mattress, our mattress pads and toppers offer the best solution. Mattress Topper vs. Mattress Pad: What’s the difference? Here at Shepherd’s Dream, we use the two terms interchangeably. 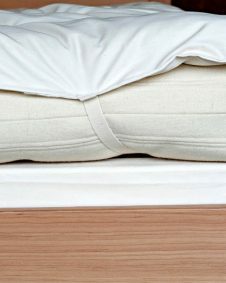 Filled with our Premium Eco-Wool batting and covered with our thick, soft cotton sateen, our wool mattress pads have elastic on the corners for easy attachment to your mattress. Eco Wool vs. Certified Organic Wool: What’s the difference? This is a question many people ask. Eco Wool is not certified organic. At this time, very little organic wool is available on the market; almost no organic wool is grown in the United States. We find that Eco Wool is actually cleaner and of higher quality than the organic wool currently available. Eco Wool is produced to the highest standards; some of these standards are beyond those specified for organic materials. Our 100% American made, chemical free wool mattress pads are light and easy to pack. So, whether you’re spending the night at a hotel, in a tent or in your RV, you’ll never have to compromise on comfort again with a compact mattress pad! Is a Wool or Fleece Mattress Pad Right for You? Mattress pads provide an additional layer of protection for your mattress, extending the lifespan of your bed’s comfortability. Mattress pads with wool filling provide an extra layer of softness and support. Wool pads are ideal for people who need additional support for medical reasons, or to augment a mattress that is too firm or too old. Also, wool is a naturally self-regulating fabric that helps keeps you warm in the winter and cool in the summer. Unlike heavier mattress toppers, our 2” wool mattress pad is lightweight, compact and easy to roll up for travel. This mobility allows you to take the comforts of home anywhere you go. In addition to providing a more cozy night’s sleep, a comfortable mattress pad made of wool helps to muffle noise from you or your sleeping partner. Though our wool mattress pad will compress between 30% to 40% within the first 6 months of regular use, wool always retains its comfort and natural resilience. Ensure a good night’s sleep for years to come. In addition, mattress pads made of wool offer all of the health and safety benefits of this naturally miraculous material – including reducing bedroom allergens, eliminating mold growth and providing a flame-resistant sleeping surface free of toxic chemicals and fire retardants. Does a wool mattress pad keep me cool? Yes! The natural breathability of wool allows you to experience maximum comfort all year long. So, in the winter, you will feel warmer and in the summer, you will stay cool. Wool helps your body regulate its temperature naturally by wicking away excess moisture. How to clean my mattress pad? 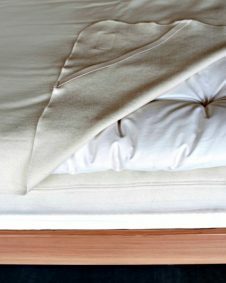 Properly caring for your natural wool mattress pad can keep your bedding comfortable and ensure its longevity. Suggested wool cleaning and care tips include: allowing your bedding to breath daily, rotating your mattress pad monthly and disinfecting your mattress pad/topper each season by laying it in the sun. Read more of our wool bedding care tips here. Where to buy a natural mattress pad? There are many places where you can purchase a chemical-free wool mattress pad online, including right here! Shepherd’s Dream invites you to browse our inventory of mattress pads and other organic bedding products. How long will my mattress pad last? 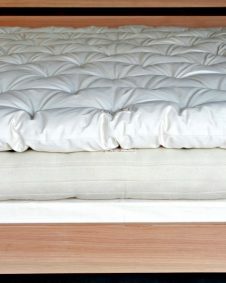 Quality mattress pads and toppers should retain their “fluffiness” for a long time. Of course, how often you should replace your mattress depends on the material it is made with, the thickness of your pad, and if the pad is properly cared for. Wool is an especially resilient material, so wool mattress pads typically last longer than bedding made from other materials. At Shepherd’s Dream, we strongly believe in the quality, design and craftsmanship of our products, which is why our toppers are warrantied against manufacturing defects in workmanship and materials for a total period of 10 years. Our 10-year warranty covers 5 years non-prorated from the day of purchase and 5 years prorated thereafter. At the beginning of the prorated period of time, the customer will be responsible for paying 1/3 the cost of the original topper plus the difference in cost of the current topper price. Every subsequent year, the topper will lose 15% of its original value until it has no value left at 10 years. 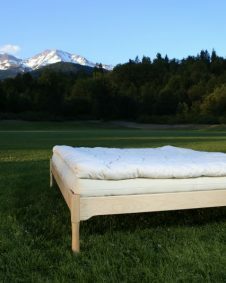 If you prefer to shop in person at a natural mattress store, feel free to stop by one of our showrooms or bed testing sites located in California (Mt. Shasta, Montague and Campbell), Oregon (Ashland, Portland and Eugene), Hellertown, Pennsylvania and Oakville, Washington. Contact us to request a sample bed set. We charge a small amount to help defray our shipping costs, which is later deducted from your first order over $500. What makes Shepherd’s Dream different from other bedding companies is that all of our products are chemical-free, pure sheep wool and 100% made in the USA. As pioneers in the American natural mattress and bedding industry, we are committed to the use of quality materials, environmentally-responsible production techniques and sustainable industry practices. Shepherd’s Dream is proud to introduce one of our newest natural bedding products – our Organic Wool Mattress Pad exclusively made with 100% pure, organically-sourced sheep’s wool and offers all the benefits of a luxurious bed topper. Our wool mattress pads and toppers can be added to any bed for extra comfort and to experience the benefits of wool bedding that is free from toxic chemicals and flame retardants. Sleep your natural best. Contact us if you have any questions about our bedding products.